Ewing's sarcoma. 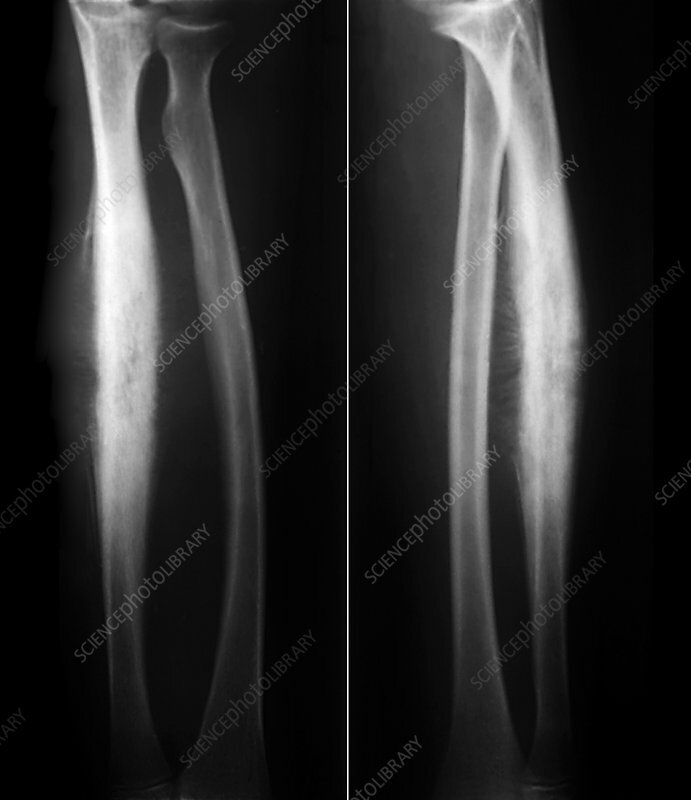 Frontal (left) and profile (right) X-rays of the forearm of a 12 year old patient with Ewing's sarcoma, a type of bone cancer. The affected area is seen as a thickened region in the radius, the wider of the two forearm bones. Ewing's sarcoma is a rare, malignant form of bone cancer that mostly arises in large bones such as the femur, tibia, humerus and pelvic bones. The condition is most common in children between 10 and 15 years of age but can also arise in young adults. The affected bone is painful and tender, as well as becoming weakened and fracturing easily. The cancer spreads to other parts of the body at an early stage. Treatment is with surgical removal of the tumour, where possible, and chemotherapy and radiation therapy.